avast! obtained VB100% awards in 2002/3 Virus Bulletin comparative reviews under Windows XP Pro and under Windows 2000 Advanced Server. ￭ On Demand Scanner – with Skinnable Simple Interface – just select what do you want to scan in which way and press the Play button. ￭ On Access Scanner – resident scanning of all files being opened, read and written and behavior blocker monitoring dangerous actions of viruses. ￭ E-mail scanner easily integrates with most mail clients and it checks both incoming and outgoing mails, it provides heuristic analysis of mail content to protect against new Worms. ￭ Boot Time Scanner – scans disks in the same way and in the same time as Windows CHKDSK does (on NT/2000/XP only). ￭ Explorer Scanner – right click on the object allows you to scan it. ￭ Screen Saver Scanner – integrates with your Screen Saver to scan PC during your coffee breaks. ￭ Virus Chest – safety isolated folder to store infected, suspicious and even some system files – to restore them. Protect your system and valuable data against computer viruses with Avast! Home Edition. Our true incremental updates are based on iAVS technology and they are available for virus definition file update and for program upgrade. You can download and install updates by simple clicking on the iAVS icon, it can be checked and done automatically when you are On-line. The update files of size under 100 KB are available at least twice a week and within couple of hours in the case of emergency of new virus. 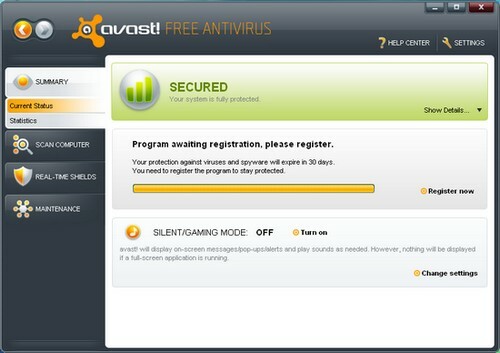 They are automatically downloaded, installed and loaded to avast! without restart or logoff. NOTE: The software requires FREE registration before the trial period end. You can register here.